LISST data from the following casts have been compromised by the presence of steep density gradients and data should be used with caution: CTD005 and CTD015-CTD018. The CTD unit was a Sea-Bird Electronics 911plus system (SN P23655-0620), with dissolved oxygen sensor. The CTD was fitted with a red (660 nm) beam transmissometer, a fluorometer, a Sequoia Scientific Laser In-Situ Scattering and Transmissometry (LISST) particle analyser and a LI-COR Underwater Quantum Sensor. Also attached was a Sea-Bird SBE 35 Temperature Logger to supply an independent check of temperature. All instruments were attached to a Sea-Bird SBE 32 compact carousel. The table below lists more detailed information about the various sensors. The rosette sampling system wasequipped with 5 l sampling bottles (Sea-Bird Improved PVC Sample Bottles based on design of Ocean Test Equipment Inc. model 110 bottle). 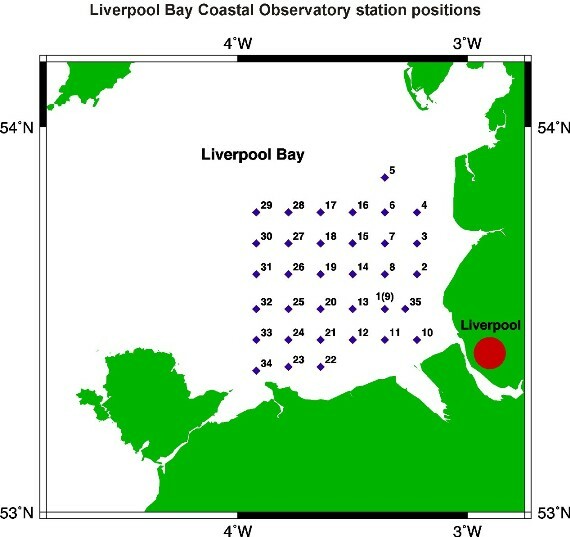 A total of 24 CTD profiles were performed during the cruise throughout Liverpool Bay. Data were measured at 24 Hz and logged to a PC running SEASAVE, Sea-Bird's data acquisition software. Rosette bottles were fired throughout the water column on the upcast of the CTD profiles. Independent temperature data were recorded at the time of each bottle firing. Salinity samples were obtained from the near-bed bottles (plus two near-surface bottles), analysed at Bangor University (BU) and the results were sent to BODC. The Department of Earth and Ocean Sciences, University of Liverpool (DEOS) collected samples from the near-surface and near-bed rosette bottles for nutrient analysis with additional samples taken for the analysis of primary productivity. Water samples were taken from rosette bottles throughout the cruise for determination of alkalinity by the National Oceanography Centre, Southampton (NOCS). Samples from rosette bottles at 20 sites were filtered to determine suspended sediment load by the School of Ocean Sciences (SOS), Bangor University. Samples were taken from rosette bottles for analysis by CEFAS. The raw CTD files were processed through the Sea-Bird SBE Data Processing software version 7.20c. Binary (.HEX) files were converted to engineering units and ASCII format (.CNV) using the DATCNV program. Sea-Bird bottle files (.BTL), with information on pressure and other logged readings at the time of bottle firing, were also generated during the data conversion process. WILDEDIT was not run on the data as no pressure spikes were present in the casts. FILTER was run on the pressure channel using the recommended time filter of 0.15 s.
Sea-Bird software program ALIGN CTD was run to advance conductivity by 0 s and oxygen by 3 s (within the typical range given in the Sea-Bird manual). No adjustment was made to the temperature channel as the fast sensor response time renders this unnecessary, according to the Sea-Bird literature. To compensate for conductivity cell thermal mass effects, the data files were run through CELLTM, using alpha = 0.03, 1/beta = 7, typical values for this CTD model given in the Sea-Bird literature. LOOP EDIT was run to identify scans which were affected by ship heave. Salinity, density (Sigma-theta kg m-3) and oxygen concentration (ml l-1) were then calculated and added to the output files using the DERIVE program. BINAVERAGE was used to bin the data (both upcasts and downcasts) to 10 Hz and remove cycles flagged by LOOP EDIT. Finally, the first oxygen concentration channel and first salinity channel (both generated by DATCNV using data un-adjusted by ALIGN CTD and CELLTM) were dropped using STRIP. Oxygen, SBE 43 ml l-1 Dissolved oxygen concentration from SBE 43 sensor DOXYSU01 µmol l-1 Converted from ml l-1 to µmol l-1 by multiplying the original value by 44.66. - - Oxygen saturation OXYSSU01 % Generated by BODC during transfer using the Benson and Krause (1984) algorithm. Reformatted CTD data were transferred onto a graphics work station for visualisation using the in-house editor EDSERPLO. Downcasts and upcasts were differentiated and the limits manually flagged. Once quality control screening was complete, CTD downcasts for all casts (except CTD14 and CTD15 where the upcasts were used) were loaded into BODC's under the Oracle Relational Database Management System. The upcasts were used for CTD14 and CTD15 as the downcasts only had data recorded for pressures greater than 5.68 dbar and 4.64 dbar respectively. Finally, the casts were binned to 0.2 dbar. Salinity samples were taken throughout the water column then returned to SOS, where salinity was determined using a Portasal salinometer that was calibrated to standard seawater. The raw Sea-Bird data, configuration and bottle files were supplied to BODC for further processing. 21 independent salinity values (obtained from water samples from the CTD rosette) were compared to pressure and CTD salinity; 4 data points were identified as outliers and removed from the analysis. The mean offset between CTD salinity and independent salinity (Autosal salinity - CTD salinity) for this dataset was found, using linear regression, to be significantly related to independent salinity at a 95% confidence level. A calibration equation was derived from the linear regression as follows, based on 17 observations: calibrated CTD = Salinity *1.015125-0.52380. The RMS error for this dataset is 0.0062450. The mean offset is -0.01639 and the standard deviation is 0.00912. 109 independent temperature values were compared to pressure and CTD temperature; 22 data points were identified as outliers and were removed from the analysis. The temperature offset (SBE 35 temperature - CTD temperature) was found, using regression analysis, not to be significantly related to SBE 35 temperature at a 95% confidence level. The mean offset is -0.002515 °C and the standard deviation for this dataset is 0.003079 °C. This is at the lowest level of accuracy for both the SBE 35 and Sea-Bird 911plus CTD (+/- 0.001 °C). Therefore, there was no adjustment to the CTD temperature resulting from the application of manufacturer's coefficients during initial processing. Where Tw is the percent transmission for pure water for the instrument (92.98%); W0 is the voltage output in pure water (4.649 volts); A0 is the manufacturer's air voltage (4.661 volts); Y0 is the manufacturer's blocked path voltage (0.000 volts); A1 is the cruise maximum air voltage (4.32234 volts); Y1 is the current blocked path voltage (0.00 volts). For this cruise, M and B were calculated to be 21.5670 and 0, respectively.